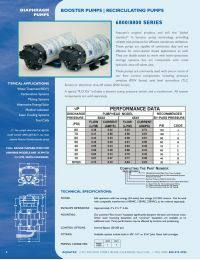 Aquatec 8800 Series Pumps are used in RO systems with flow rates greater than 50 GPD. Reverse osmosis systems require pressure to work properly. A booster pump is suggested for applications where the feed water pressure is low, and where there are high levels of Total Dissolved Solids (TDS) in the water. 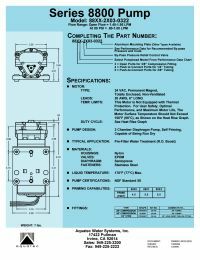 The 8852-2J03-B423 is designed for operation with a tank shut-off switch (PSW), which shuts off the RO booster pump when the storage tank becomes full. In under-counter RO systems the PSW can be coupled with an Electronic Shut-Off valve (ESO) in order to shut off the feed supply so the system does not waste water. Expels trapped air and eliminates "air locks"